I have written about being sick before. About how I cannot eat anything for a couple weeks, and then there is an emergence, after watching hours and hours of Food Network and Cooking Channel, where weeks of inspiration pour out into the kitchen. I have done that before. And the results were well worth the wait. Alas, not much has changed. Again, I was sick. Again, I ate saltines day after day, and more yogurt than one can imagine. Again, I spent my days watching food television, welcoming repeats so I can memorize the gist of the recipe without breaking out the laptop and finding it online. And again, I was inspired by one of those recipes to make my first dish out of sickness. We know that toast is all the rage. You can find avocado toast, and ricotta toast, and cream cheese and honey toast, and every toast imaginable these days. And they are delicious. 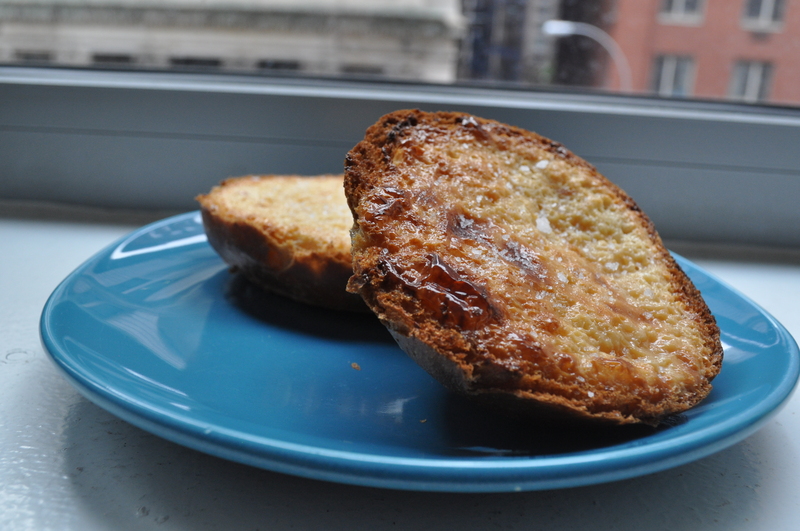 But I am about to introduce you to the easiest (yet so impressive-seeming) brunch toast imaginable. It is so good that I could only name it the best brunch toast ever! 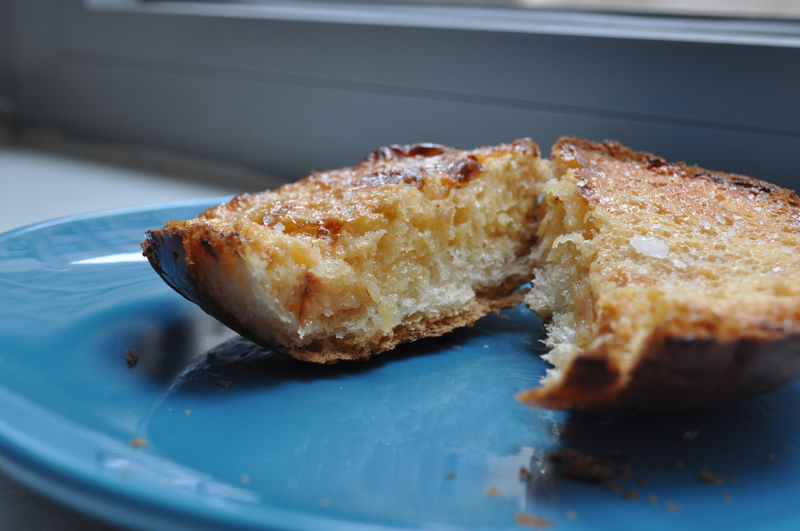 I mean, it an already buttery and rich bread, slathered with butter and condensed milk, broiled until it all caramelized together, and if that’s not enough, it is finished off with a sprinkle of sea salt. Come on, people! This toast is so good that I almost want to get sick again so I can see what other yummy things will eventually come out of it. Remember this butter that I whipped up? I cannot help but think that this would be incredible on this toast. 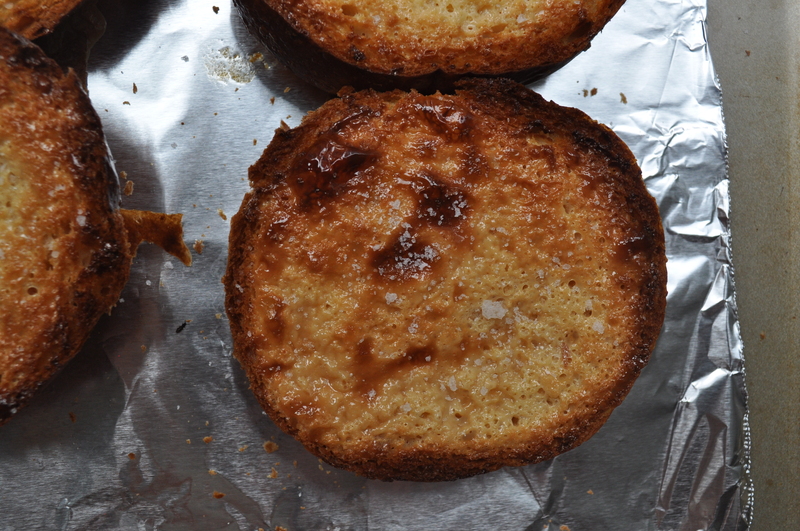 But, I chose to forego the extra work this time, and still wound up with this sweet/salty caramelized, dulce de leche, best toast ever. But, you know, even that has the potential to be even better! Preheat oven to 350. Line a baking sheet with aluminum foil, and spray with cooking spray. Lay the halves of the brioche on to the baking sheet. 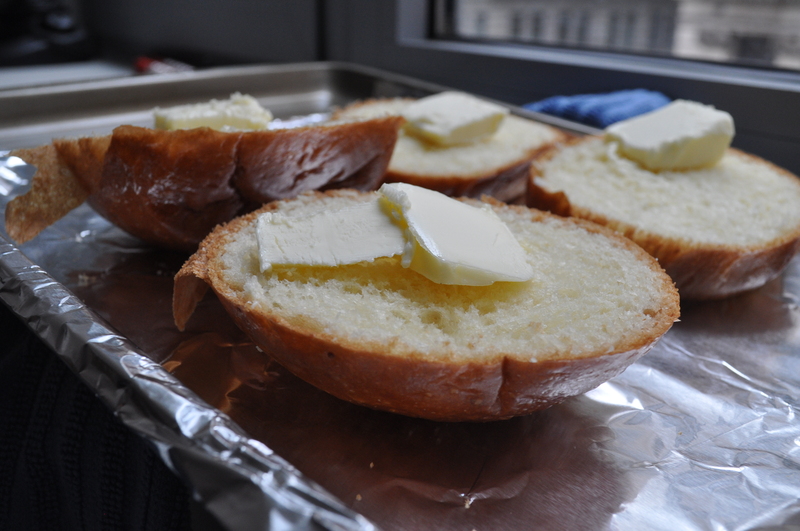 Spread a tablespoon of softened butter evenly on each of the halves. Place in oven and let toast for about 5-7 minutes. Take out of oven. Turn on the broiler. 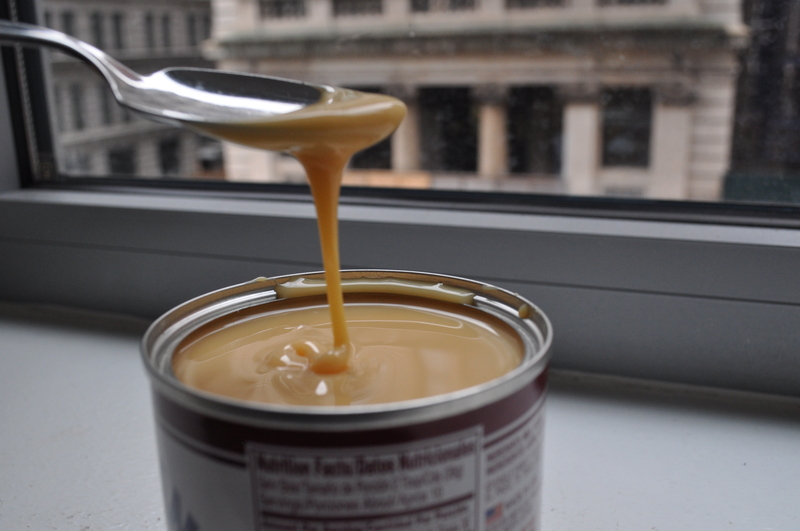 Spread 1 tablespoon of condensed milk on each of the toast halves, making sure that it is even, and stays on the bread. Place the tray under the broiler, and let it heat up and caramelize, about 5 minutes. Take out of the oven, and sprinkle with sea salt. Let cool slightly and serve. I have a tendency of turning desserts into other desserts. Let’s turn a cookie into a cake, I think! Why can’t a biscotti be a pie?! Can rice pudding be an ice cream flavor?! This is obvious in my many attempts to create cannoli cakes, and s’mores ice cream. Or really, my favorite: cannoli s’mores. It’s actually super fun to create desserts into other desserts! You want something familiar, but with a new (and exciting!) twist. It’s unexpected, and brings life to a whole new dessert. I obviously take my desserts seriously, people – work with me. This time, the two dessert combo was churros (with chocolate), and cake. I wanted to get that iconic crunchy cinnamon sugar outer edge, with a light, fluffy cake, sandwiched with creamy, decadent chocolate ganache. And, that, my friends, is exactly what we got. This cake is exactly what a churro is. Light, but decadent. Not too sweet, but just sweet enough. Served with a dark, dripping chocolate. And just like churros, you can’t stop at just one. 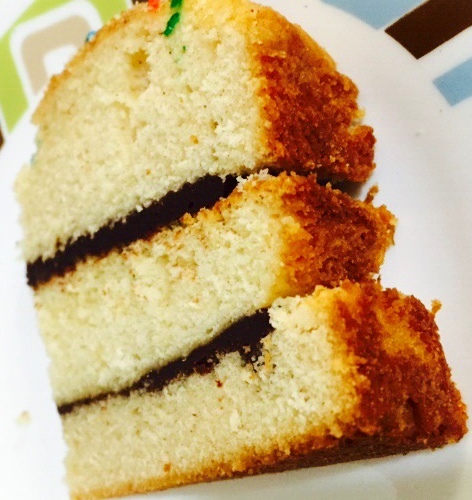 I have doubled the recipe below – that was the only way it would have enough height to make a layer cake. 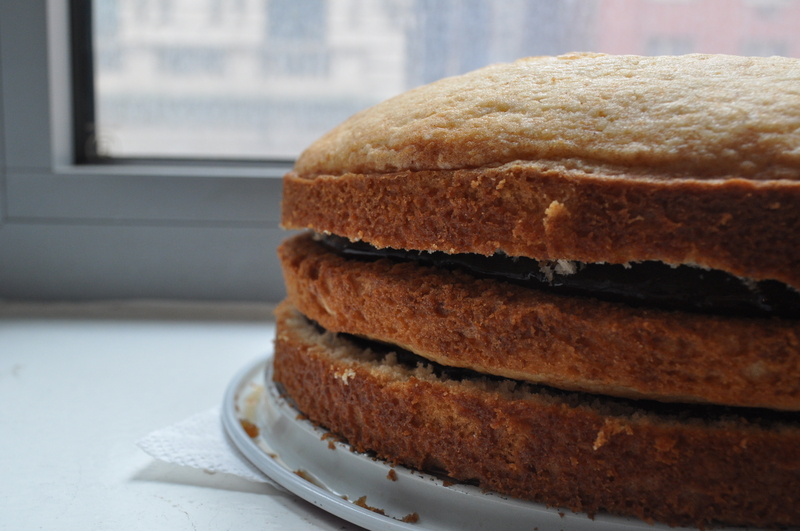 However, I first made the recipe how it was originally stated, and added that layer as part of my three layer cake – just in case if you want to do the same. Also, let’s think about taking this cake to another level. Already, you will be spreading butter and sprinkling with cinnamon and sugar on every layer. But if you have the patience (and can stand the mess), why not do the same thing with the sides of the cake?! Why not, I ask. You ponder that. Preheat oven to 350°F. Spray a 9 inch springform pan (or cake tins) with cooking spray. In a medium bowl, whisk together the flour, baking powder, salt, and cinnamon. Set aside. Mix together milk with vanilla. Set aside. Using an electric mixer, cream butter and sugar, until light and fluffy – about 4 minutes. Add egg and beat until smooth. 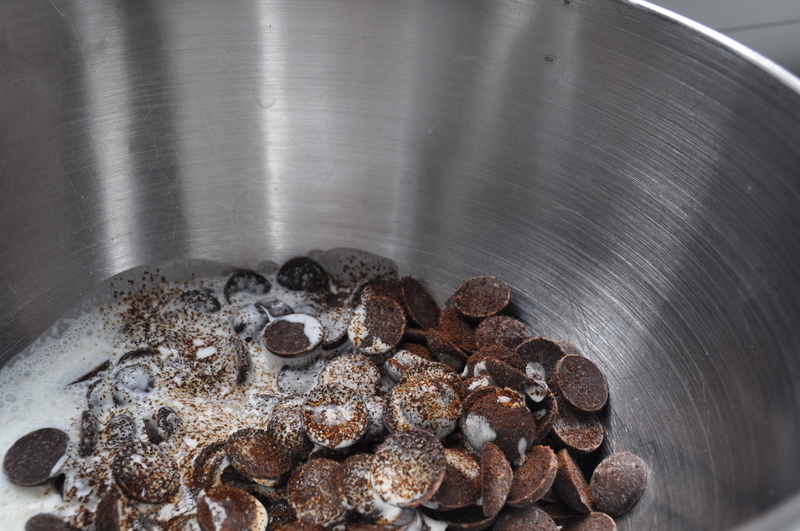 Alternating with the milk mixture, beat in the flour in thirds, beginning and ending with the flour mixture. Beat until well combined. Spread mixture into prepared pan and bake for about 40 minutes or until golden and risen and a skewer inserted in the center comes out clean. Cool in the pan over a wire rack for 30 minutes. Carefully unmold and cool completely over a wire rack. Meanwhile, make the chocolate ganche: Over a double boiler, whisk together cream, chocolate and espresso powder until smooth. Set aside to cool. Cut the cake in half horizontally using a large serrated knife. Place the bottom half of the cake onto a serving plate. Brush with melted butter and sprinkle evenly with cinnamon and sugar. 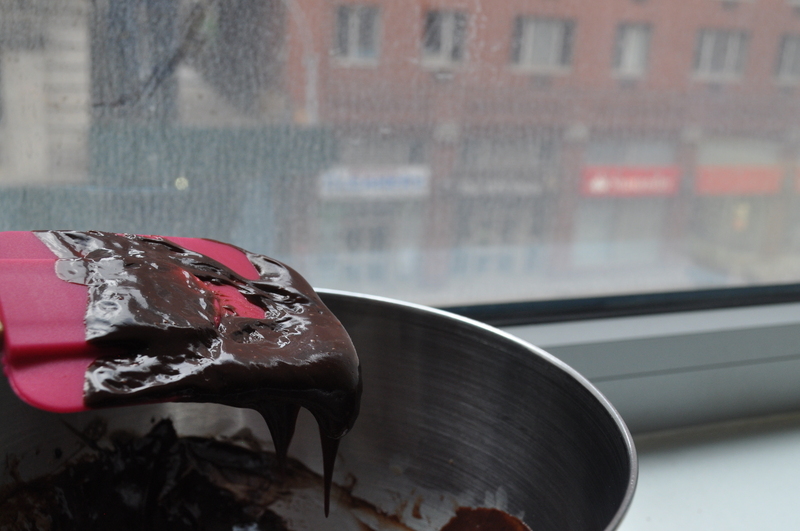 Spread the chocolate ganache evenly on top. (If making three layers, as noted above, evenly distribute both the butter/cinnamon sugar mixture, as well as the chocolate ganache). 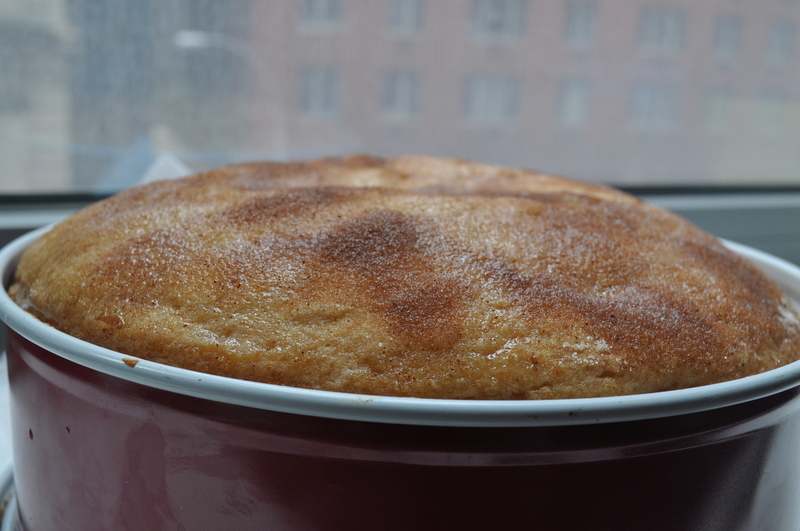 Top with second layer, and repeat with butter and cinnamon and sugar.